If a Medicare Part D or Medicare Advantage plan with a 5-star rating is available in your area, you can use the 5-star Special Enrollment Period (SEP) for a once-a-year opportunity to switch from your current Medicare plan to a Medicare plan with the "5-star" quality rating. The 5-star SEP is available to you at any time during the plan year. 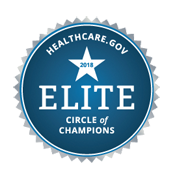 Unfortunately, the 5-star SEP is only available in areas of the country (states or counties) where you find Medicare Part D or Medicare Advantage plans that have achieved a 5-star quality rating and naturally, the number of plans with a 5-star quality rating can change year-to-year. For example, in 2017, around 11.5 million Medicare beneficiaries will have access to the 5-star SEP.
Special Enrollment Periods (or SEPs) allow you to change to another Medicare Part D or Medicare Advantage plan outside of the annual Open Enrollment Period that starts on October 15th and continues through December 7th. SEPs are only granted for specific reasons (such as when you move outside of your plan’s service area or enter into a long-term care facility). You can click here to read more about the Special Enrollment Periods that may be available to you. Remember, if you are one of the (around) 12 million people eligible for the Medicare Part D Extra Help program, you are granted a continuous Special Enrollment Period and allowed to change Medicare plans at any time during the year. In 2012, the Centers for Medicare and Medicaid Services (CMS) established a Special Enrollment Period (SEP) allowing Medicare beneficiaries eligible for Medicare Part D prescription drug plans (PDP) or Medicare Advantage plans (MA and MAPD) to switch to a 5-star plan at any point during the year. What law allows the creation of this SEP? CMS exercised statutory authority under Section 1851(e)(4)(D) of the Social Security Act to establish the 5-star Special Election Period as part of CMS’ overall quality effort, combined with the quality bonus payment demonstration, to give plans greater incentive to achieve 5-star status. What data is used to create the 5-star quality rating? CMS uses the quality rating information gathered from the previous year to determine a Medicare Part D or Medicare Advantage plan's quality rating and the summary quality star rating is awarded on a calendar year basis. For example, Medicare plan ratings for the 2013 plan year were published in the fall of 2012 using data collected prior to the 2013 annual Open Enrollment Period (AEP). Again, the summary quality star rating is provided by CMS prior to each Annual Election Period (AEP) or annual Open Enrollment Period and star ratings are effective for the following contract year (January through December) . Who is eligible for this SEP? If I use the 5-star SEP, when will my new 5-star plan coverage begin? Effective dates for enrollments made under the 5-star SEP will be the first of the month following the month the enrollment request is received. Once an individual enrolls in a 5-star plan using this SEP, the individual's SEP ends for that plan year and the individual will be limited to making changes only during other applicable election periods. As a reminder, the 5-star rating SEP can only be used one time during the plan year.